"Steve, I am getting so many good comments from your tribute to Amon. Our pastor........a wonderful man........is using some of your words in the funeral service tomorrow." I absolutely appreciate the outpouring of sympathy that came as a result of yesterday's diary entry. I wasn't thinking about that when I wrote it, but it was a nice side effect. Thank you. The timing of all this is almost mystical because I have been in the middle of planning a candlelight memorial service on Nov. 20th, World AIDS Day Eve at Metropolitan Community Church in West Hollywood. Adding to it all, the deaths of Warren Zevon (much beloved in this town), John Ritter (also beloved in this town), and Johnny Cash (beloved all over the world but kind of ignored in much of TV-town because he was a musician over the age of 23). TLS list members Danny and Karl were visiting from Michigan and Danny, on a Sunday morning walk from the Day's Inn on the east side of Hollywood Blvd. to the "center" of it all perfectly captured how the latter two deaths, both dead on the same day, were celebrated by their fans. These were the flowers that were left overnight. 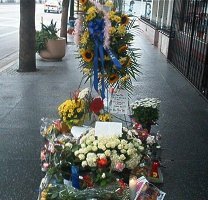 John Ritter's star has a huge flowery bouquet, like the kind you'd find at the fanciest of funerals. Bundles of flowers line the star, along with fresh lit candles, fuzzy teddy bears, love letters, bundles of flowers still in their plastic wrappings, American flags, tributes, all laid out beautifully around his name. 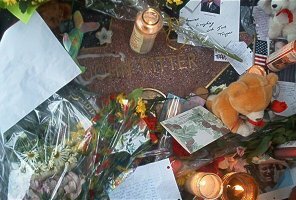 John Ritter's memorial star on Hollywood Blvd. 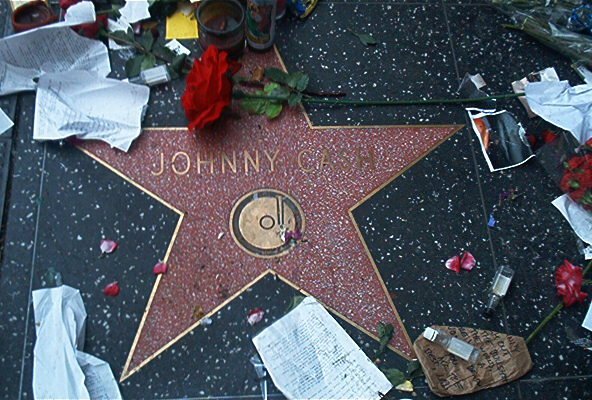 Johnny Cash's star on Hollywood Blvd. the day after he died. Empty bottles of whiskey, scrunched up pages of poetry and lyrics, some black roses jammed into a candle jar, smashed-up flowers -- one pictures the long drinking / singing / poetry / protest session all night long -- mixture of punks, drunks and country thugs raising a toast to the greatest of the great, huddled around the campfire of a Hollywood Blvd. star. And at the top of his name, a perfect red rose. 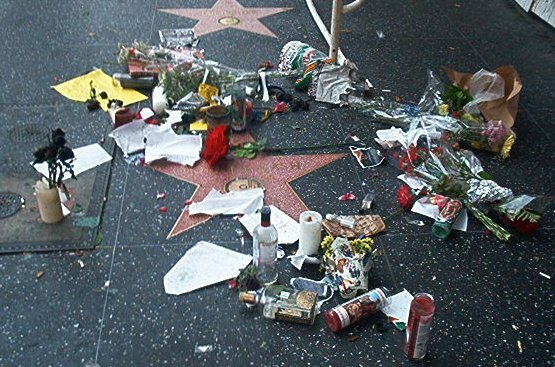 It made me wonder, if I ever have a star on Hollywood Blvd., what would my star look like the morning after I'm dead? That brings me to back to the memorial service. The intensity of the grief I've been processing is not something I've gone through in a very long time. Funny how it all feels brand new and yet familiar. The loss is almost unbearable. What surprised me was how physical it was. How much my stomach hurt and my head hurt. How I was almost unable to think or to focus on anything. For several hours after my nap yesterday, I just laid there, absolutely unable to move. I felt stoned. The pain today is different. It's evolving. Grief may not be fun, but it's cleansing. It's healthy. It's necessary. If you don't process it, it lies there in your gut. You may not even know it's there. You don't want to go there. If you forget, maybe it'll just go away. But it doesn't go away. Those tears are going to get cried whether you want to do it now or later. Leave them there uncried and they will rot and turn into anger or ulcers. I've been dreaming of this project for years -- based on a title Jimmy and I came up with during one of our writing/creative sessions several years ago. It is called "A Joyful Lamentation" -- a celebration of the lives we've lost and a safe place to cry your eyes out if you need to. The first one is planned for Sunday night, Nov. 30th, World AIDS Day Eve at Metropolitan Community Church in West Hollywood. Logo for A Joyful Lamentation. I'll have more information as the event develops. But the point is to get away from the dour sadness that marks so many of these events and to turn the tears into joy and celebration of the lives of the people we loved so much. We will want to bring them back into the room with us and remember them with tears of happiness. Kleenex provided! Hunky huggers standing by! The Deacon and the Best Actor. As part of the preparation for "A Joyful Lamentation," I decided to pay a visit to the Carl Bean House. 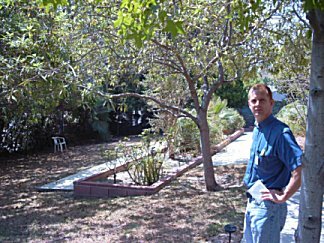 I had never heard of it until I read in the MCC-LA morning church bulletin (between bouts of weeping and gnashing of teeth) that the chaplain for Carl Bean House is from MCC-LA. So I called him out of the blue, told him I was a songwriter living with AIDS, that I was organizing a candlelight/memorial service for World AIDS Day Eve. We set an appointment for 1 p.m.
My goal was to schedule a private concert for the patients and staff there, but also to just see Carl Bean House and to look at the work being done there. That morning, Tuesday, when I arose I began working in my upper room, multi-tasking like crazy. I was sending out emails about A Joyful Lamentation while redesigning the artwork, listening to "I'll Cover You" from RENT -- the Jasons have asked me to sing it for their wedding this weekend in Ithaca NY, writing up the diary page from yesterday (which includes editing photographs), reading and answering notes from people who wanted to share their feelings about death and memorials -- "I haven't been to one in year. I think everyone has kind of forgotten about us", read the latest updates on HIV (there's a new proposed therapy that involves chasing out the HIV cells that are hiding and then zapping them with some kind of poison from "a tree native to the Pacific island of Samoa," and also working a bit on the music from our new show that we're writing. After too much of the above, I decided to clear my head by cleaning the kitchen a bit. Jimmy stirred so I brought him his coffee. He seemed unusually nervous / anxious / happy. He said, "The Ovation Awards nominations are out today. I really, really hope we get a nomination." The Ovation Awards are handed out by the Theatre League Alliance of LA. In other words, these awards are to Los Angeles what the Tonys are to New York. That doesn't mean an Ovation is considered by the outside world to be even close having the value of a Tony, but for a new show like ours which is trying to build awareness and credibility (being new and largely unknown), a nomination gives added credibility and new reasons for the press to write about you. The reason you want the press to write about you is because if they don't, you are invisible. If you are invisible, you cannot sell tickets. Producers like to sell tickets. So, getting this nomination would mean a lot for us. I started to feel the "tingle" of anticipation. The odds were stacked against us. We didn't have a big producer when we ran in LA and we had no promotion money for ads. The only real "media" we got was in the theatre sections of the gay press -- thanks to writer/critic Les Spindle who was a huge fan of TLS, Variety's Julio Martinez, and Backstage West's Polly Warfield among others. Readers might remember that we opened at the same time as the EdgeFest but we weren't a part of Edgefest because TBV hadn't even been written when the submission process was open for 2002. So, almost all the critics were booked on our opening night. If we got an Ovation nomination it would be because the voters themselves found us through word of mouth during the run. You couldn't have stacked the odds less in our favor. But I was hopeful because of the completely unexpected nomination and win for Best Musical Score by the LA Drama Critics this past Spring. Clearly, someone out there in "pressland" had seen the show and clearly they thought it worthy. After I ate my morning breakfast routine of Metamucil (double dose), oatmeal, non-fat cottage cheese and apple, I put on my shorts and tennis shoes to go jog/walking, determined to keep up the pace I had set for myself on our retreat. Jimmy looked over my "ensemble" and chose the TLS-Houston baseball cap, a perfectly colored coordinated AIDS guy working off his triglycerides. It was already getting hot, the coolness of the moist ocean/desert night air beginning to give way to the dry heat of the mid-morning. But I dutifully made my way to Laurel Cyn. Blvd. and fast-walked around the neighborhood. I see three old houses have been knocked down and the land cleared for more big apartment buildings -- they raise our rent every six months, refusing to give a lease to anyone -- our once slightly depressed area beginning to fill with high priced apartments. The gas prices are back up over $2.00 a gallon. I wonder what that's about? I was out for about 45 minutes, pausing to get some water and rest a bit, then walked/ran my way home. When I arrived, my t-shirt was soaked with sweat (shockingly revealed to me by the air conditioning) and I walked into the bedroom to find Jimmy crying like a baby. I didn't know what was going on. "Who died toDAY??? "Both Peggy and Mary Jo just called." He started crying again to the point that he almost couldn't get the words out. "We've been nominated in TWO categories!" "YOU ARE KIDDING!! TWO?? Which ones??" "Best World Premiere Musical -- against 'Judy's Scary Christmas.'" "...and Lead Actor in a Musical, Jim Brochu." Now we're jumping up and down, expressing our incredulity. We scare the cats who go running. I let him know it should have been for Best Acting Ensemble. We hug and kiss and hug and kiss. He cries. I yell. It was all good. Then I remembered the time. I raced upstairs and zapped the news onto my family lists, uploaded it to the webpages (embarrassed that I hadn't updated TBV site since the announcement for the NY reading), and then ordered Jimmy to make me a sandwich so that I could eat lunch before joining Deacon Tim down at Carl Bean House. "All My Children" is running in the background while we munch on our turkey sandwiches. Time to run! I grab the camera and make my way down Western to southeast LA. Didn't know what to expect. This was not an area of town I've visited very often. The Carl Bean House is very deceptive from the outside. It has a very welcome "homey" look to it, nestled behind ivy covered walls. Very warm. Very inviting. I wasn't sure where to go so I just kind of wandered the rooms. The front part looks and feels like a home. Couches, chairs, nice things on the walls. Nothing looks new. It all looks very lived in, comforting. I passed a lunch room and a nice smell was in the air. People were sitting together at tables eating. I wanted to join them and just talk to them. Finally, I passed into a larger, more modern area and found a nurses station. I asked for Tim Hamilton. "The Deacon? I saw him around here somewhere. I'll try to find him for you." "I'm early so he's not expecting me yet." I took a place at a big circular couch in a large atrium room. It felt warm. There was so much sun. As a person who has lived in hospitals before, I thought this was really wonderful. I pictured myself as a patient here and thought, "This would be my favorite spot to sit and just be." Soon, Tim arrived. Young. Handsome. Beaming a smile. Sincere. I liked him immediately. The thing that impressed me the most was how utterly filled with love and gentleness this man was. He led me to a little corner on the second floor. Two chairs at the end of the hallway against the window. "This is one of my favorite spots." As we talked, he greeted all the patients who wandered by. You could tell how much they adored him and how much he knew about them. One was excited because today he would be moving back home with his mother. Tim teased him about having so much stuff to pack. "What I love about this place, which is a part of the AIDS Healthcare Foundation, is that it accepts patients, no matter their ability to pay. I'm very proud of that. So we have a total cross-section of people, from welfare moms to people born into wealth." "Carl Bean House used to be a hospice. 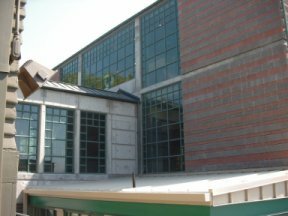 There used to be three run by AHC back when people were dropping like flies, but now there's only this one and while we do hospice care, there's also a clinic and a skilled nursing care facility." We walked back down to the atrium room. 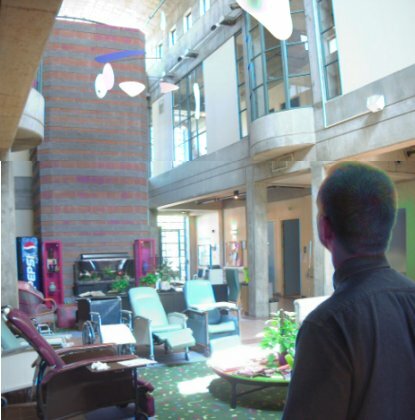 Carl Bean House atrium. The nurses station is just behind us. attached to the older house in front. A foresty-feeling back yard away from the city noises. I told him I wanted to invite him and whatever mobile clients they have to performances of The Big Voice we are in the early stages of planning for the end of October. He told me we'd have to plan it well. Their one van hasn't run in a long time so they don't a way to take the clients on field trips. He said, "We'd have to take taxis and it'd be very difficult, but it might be worth doing." We walked back into the atrium to another little sitting area (which was very noisy with trays rolling around and the elevator opening) and I encouraged him to tell me more about their needs. I told him I didn't have money but that sometimes readers of my diary are happy to give a little, even if it's just a few bucks. (I got the feeling that even $20 is a lot for them -- the facility is nice but there's no real money for the extras that make life easier for patients). He has a deacon's fund but it doesn't really have that much in it and people are forgetting that it exists. His one big wish was to be able to provide DVD players in all the rooms. "The problem," he explained, "is that they all have to be identical. You cannot ever give the perception of playing favorites in a place like this. Everyone has to be treated equally." I told him about our trip to the Harlem Community AIDS Center back with TLS was playing in NY. How it opened my eyes to the underclass that lives right alongside the rest of us. Obviously, Tim has worked with street people before. 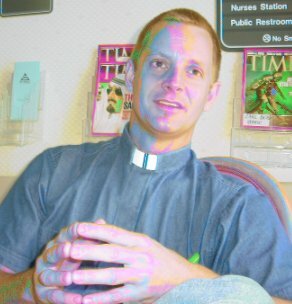 He described once how people would naively donate cans to the deacon's pantry. "Homeless people can't open cans. We had all this food and none of our clients could use it. So we had to educate the donors to give us easy-open single serving food. And you can't give a homeless person good shoes. They'll be stolen the first night. The best gift is soap and clean razors. It's like gold." We came across an old upright piano just off the atrium room. "Is it in tune?" I asked. "I doubt it," he responded. "How much would a tuning cost? I might have $50 in the deacon's fund." "No. It would cost more than it's worth. If it's out of tune, I'll find a keyboard or something." I touched the piano. It wasn't bad. Not exactly in tune but not exactly terrible either. I started playing "Going It Alone." Deacon Tim walked behind me and started opening doors. I finished the song. "I wanted everyone to hear. It's amazing how it changes the mood of the room, makes everything more peaceful." I played "When You Care." And it was time to go. I promised to book a Wednesday soon. Then I gave him a CD of music, invited him to make copies for any client who might want it, and decided that I would schedule a Steve Concert for a Wednesday in October and returned home to my Best Actor nominated best friend, thankful that I no longer needed to live in a Carl Bean House, and determined not to forget those who do. This past weekend, we spent Ithaca, New York as a part of a gay commitment ceremony. I sang three songs, Jimmy conducted the ceremony -- they didn't want a preacher, they wanted Jimmy (who after accepting, promptly went on the net and became a minister of the Universal Life Church "able to perform all clergy functions except a briss"), and the two boys -- our adopted kids, the Jasons, looked into each others' eyes and made everyone cry with their heartfelt, frequently humorous, but sincerely touching vows. There was one song they wanted me to sing -- "Song of Surrender" -- but it's about a couple that's broken up, so I wrote a new lyric to it in the plane on the way to the ceremony. I started with it, then sang "Not While I'm Around," and then "Near You" (from The Big Voice). I'm going to be writing up a diary entry about this but thought you guys'd like to see my Jasons. They are Jimmy's and my adopted children. These are our sons as much as any two kids could be without having our DNA.